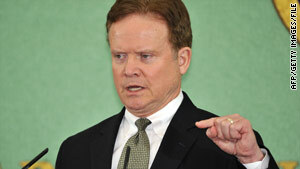 Sen. Jim Webb is "really disappointed" in his party's accelerated push to repeal the "don't ask, don't tell" policy. Washington (CNN) -- A leading Democratic voice on military affairs has criticized members of his own party for the hurried way in which congressional Democrats and the White House are pushing through the repeal of the military's "don't ask, don't tell" policy. President Obama, Defense Secretary Robert Gates and Adm. Mike Mullen, Chairman of the Joint Chiefs of Staff, have all stated their belief that the policy should be changed. In an effort to lay the groundwork to do away with "don't ask, don't tell," Gates and Mullen have commissioned a thorough survey of U.S. service members in order to ascertain how the force structure feels as a whole about having openly gay and lesbian members serving within their midst. The results of the review will not be available until December but in an apparent acknowledgement that they may not have sufficient votes to support a repeal after this November's midterms, the White House and Democrats on Capitol Hill moved forward last week with efforts to pass a law that would repeal the policy. The House approved the provision as part of a larger defense spending bill and the Senate Armed Services Committee also approved the measure. The legislation, if passed, would not take effect until the military's internal review is completed; it also requires the president, Gates, and Mullen to sign off on the policy change. Notwithstanding these measures intended to defer to the Pentagon, Sen. Jim Webb, D-Virginia, still faulted the legislative moves to fast track the repeal. "I was really disappointed in -- in the way that this process was accelerated. I was the only Democrat that voted against this in committee markup," Webb said in an interview aired Sunday on CNN's State of the Union. Webb, himself a Vietnam veteran and a former Secretary of the Navy, sits on the Senate Armed Forces Committee and is the Chairman of the Armed Forces Personnel Subcommittee. "I believe we had a process in place. And to preempt it in some ways, showed a disrespect for the people in the military," Webb told CNN Chief Political Correspondent Candy Crowley. "They should not have done this," Webb added. Webb equivocated when asked whether he thought the move to repeal the Clinton-era policy smacked of politics in advance of this November's midterm elections. "There are a lot of people who feel very passionately about this. I think, you know, everyone can explain their own motivations. But for me, I just think it was a bad signal to the people in the military to do it this way." Webb described the votes last week on Capitol Hill as "the Congress jumping ahead of the process" set up by the Pentagon to study repealing the policy. The Virginia Democrat was so adamant in his belief that the concerns of the military not be ignored that he refused to take a position on whether the policy ought to be repealed. "I think we should listen to the military. We should hear from the military," he told Crowley.